This DS Studio trolley is designed to organize your salon accessories. 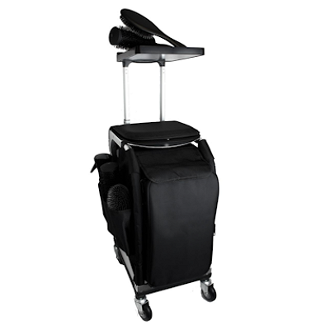 Keep your accessories at your station with this mobile trolley station. Specifically designed for the hairdresser this trolley features two removable inside shelves, and includes 2 zip around storage pods. Inside of the zip open door you will find organizer slots/bands to hold your tools. Includes a molded plastic tray that is stored inside of the case and easily snaps onto the top of the retractable handle to provide a working tray as shown in photo. Sturdy metal frame and 4 rolling caster design with padded seat top allows you to straddle the trolley and use as a rolling seat or cutting stool. Large open side pockets for brushes and tools. Retractable trolley handle. Durable Nylon material Construction. Trolley Size: 22" H x 13.5" Depth x 10-3/4" Width. Inside pods measure: 10”L x 8”W x 3-3/4” H ***Coordinates with DS Artist Organizer Pod Case offered separately. The DS Artist Organizer Pod Case slips over the DS Studio Trolley retractable handle for easy travel. Separate Artist organizer pod case is shown in photo on right for reference. Note: The tools and Separate Artist Organizer Pod case are not included. Includes: DS Studio Trolley, 2 inside storage pods, and one molded top tray.